On September 2, 2007, at 1508 central daylight time, a Cessna 172M, N1502V, collided with the terrain following a loss of control while maneuvering at a low altitude over residences in Union Star, Missouri. The solo student pilot was fatally injured. The airplane was destroyed by impact with the terrain and a post impact fire. The Title 14 Code of Federal Regulations Part 91 personal flight was operating in visual meteorological conditions without a flight plan. The local flight originated from the Rosecrans Memorial Airport (STJ), St Joseph, Missouri, at 1347. Several witnesses in the area reported hearing and seeing the airplane prior to the accident. One witness reported seeing the airplane circle his property eight times. He reported that during the last circle the airplane was extremely low and in a very steep left bank. As the airplane cleared his house, it nosed straight down, hitting a power line with the left wing prior to striking the ground. He stated the airplane caught fire when it impacted the ground. Another witness reported seeing the airplane “buzz” his house four times at very low altitudes. He stated the airplane was diving and climbing as it flew over. Another witness estimated the airplane’s altitude as being 150 to 200 feet above the ground as it circled over the area making shallow climbs and descents. She stated the airplane then made a slight climb in a steep left bank over her neighbor’s house prior to descending nose first into the ground. One witness reported seeing the pilot throw something out of the airplane attached to a parachute or balloon. Missouri State Highway Patrol searched the area and nothing matching her description was found. This witness stated that the pilot was a friend of her brother who lived in a near-by house. The student pilot, age 17, held a student pilot certificate that was issued on May 15, 2007. The pilot had a total flight time of 22.7 hours of which 7.2 hours had been logged as solo flight time. All of the pilot’s flight time was logged in Cessna 172 airplanes. The pilot’s logbook contained an endorsement for solo flight dated June 25, 2007. The student pilot was a member of the Civil Air Patrol and according to his flight instructor he had received his initial flight training at the CAP National Flight Academy in St. Joseph, Missouri, earlier in the summer. The instructor stated he spoke with the pilot on the morning of the accident and had instructed him to practice ground reference maneuvers, steep turns, and stalls in the practice area 10 miles west of STJ. The instructor stated the student pilot had family that lived near the accident site. 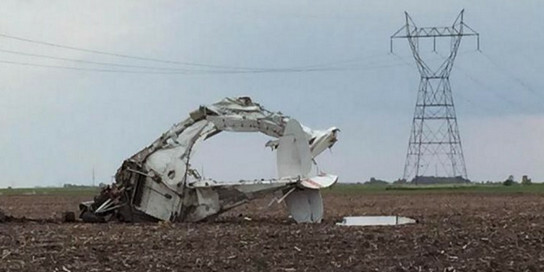 A utility pole was positioned approximately 3 feet from the left wingtip of the airplane. The center section of the airplane from the engine to aft of the rear seats was destroyed by fire leaving the aft fuselage and wings separated from the remainder of the airplane. The empennage was intact having sustained minor impact and heat damage. the right wing sustained fire and heat damage. The inboard section of the left wing sustained fire and heat damage with the outboard section of the left wing being intact. The aileron and flap surfaces remained attached to both wings. The aileron cables remained attached to the cockpit controls and the flight control surfaces, but had been cut near the center wing area by rescue workers. The elevator and rudder cables were connected to the cockpit flight controls and were severed where the empennage section was separated from the remainder of the airplane. The flap actuator indicated the flaps were in the retracted position. The elevator trim setting was measured to be 1.3 inches which equates to approximately 5 degrees of tab up trim. The engine sustained heat and fire damage. The propeller remained attached to the engine. The propeller, with the exception of approximately 10 inches of one blade tip, was buried in the ground. One propeller blade was straight. The other blade was bent rearward and twisted. Both propeller blades contained chord-wise scratching and leading edge polishing. Both the mixture and throttle controls were full forward and the fuel selector was selected to the “both” position. have resulted in the accident. The National Transportation Safety Board determines the probable cause(s) of this accident to be: The student pilot’s failure to maintain adequate airspeed and the subsequent inadvertent stall while buzzing residences. Contributing to the accident was the pilot performing buzzing maneuvers. Be the first to comment on "CAP Pilot Buzzes House & Slams into Ground"